In the first year alone, more than 15,000 recognition moments were captured and 66% of employees received recognition through Baystate Celebrates! Learn how First Tech partnered with Workhuman to implement a human application solution that enhances engagement while creating deeper connections to company values and business goals. Qlik recently underwent a complete performance management transformation. Learn how Qlik worked with Workhuman, its human applications partner, to realign its people process to the pace of business. As with many large, global corporations, Eaton was challenged with driving a culture of recognition that made every employee – no matter their function or location – feel valued and appreciated. 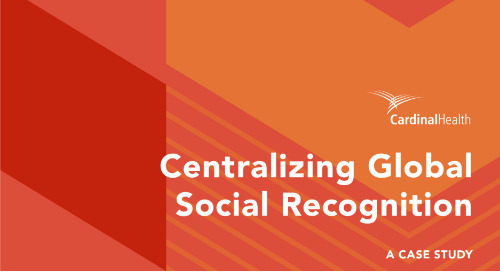 Cardinal Health partnered with Workhuman to launch its first global, social recognition solution, Bravo!, designed to support a culture of recognition and appreciation across the entire organization.